Flutter of Imaginations is a set of four stories revolving around friendships, overcoming fear, and following your passion. In “The Pool Party,” Chelsea overcomes her fear of water and stands up to a bully with the help of her friends. “Dystopia (The Day Everything Exploded)” presents Tai, a local eleven-year-old girl who survives an explosion set off by Hanh Dam and his conspirators that wipes out Japan. In “The Dog Diaries,” Chloe and her parents are worried about their Labrador, Stella, and go to the vet for some answers. “The Battle of the Bakers” is about Zoe Moore’s trials and tribulations when she enters a national baking competition as she manoeuvres life, friends, and her love for baking. Tia Tewari has been an avid reader ever since she learnt to understand words. She has travelled to many parts of the world, moving six times in twelve years. 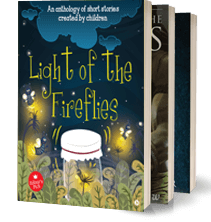 This is her first published compilation, a collection of short stories she wrote between the ages of eight and eleven. Her characters are loosely based on the friends she made in the various schools and neighbourhoods she was part of in different countries. Apart from reading and writing, she loves to swim, play golf, bake, play with her dog, Groot, and sometimes annoy her little sister, Anya. Tia currently lives in Dallas, USA. She is in the eighth grade and will soon be turning thirteen.